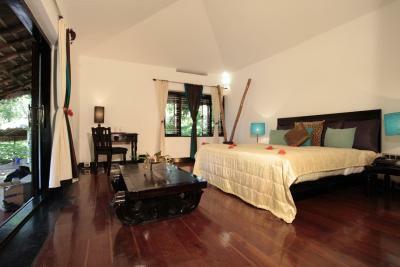 Lock in a great price for Shalimar Spice Garden - An Amritara Private Hideaway - rated 8.8 by recent guests. Friendly helpful staff. Massages and yoga excellent experiences. 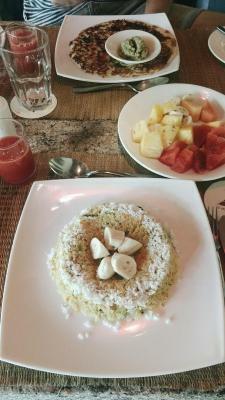 Loved the INDIAN breakfasts and the milkshakes. Loved the enchanting, peaceful tropical gardens with amazing birdsong. Loved the outdoor dining terrace. Paul our host, made us feel extremely welcome and took care of all our needs. Very friendly service, immaculately kept gardens and bungalows. Food was very good. The cottage and hotel layout were just great. The services, food and offered massages and activities were amazing. Loved the staff/place and would def. consider come back again. Recommended to all. 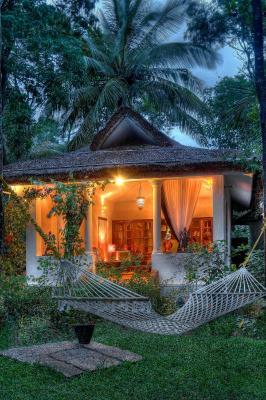 A wonderful place to stay from the hurly and burly. Great place to relax and take life slowly. Very friendly staff and a good value restaurant. The garden and setting is magnificent. The dinner buffet was delicious. The room was comfortable and full of character. Great bed. Helpful staff. Absolutely sublime hotel and would highly recommend. The location was fantastic, a quiet and peaceful retreat away from the manic town and national park! Hotel facilities were good, -pool and treatments available. Our room/ lodge was comfortable, quaint, and it felt individual and tranquil, it had all we needed. The gardens lovely to wander around and learn about spices etc. The restaurant food was great. The waiters were excellent in particular Anesh who was so happy and friendly every time we saw him. All of the staff were extremely helpful and accommodating. Cannot thank all of the staff at the hotel enough for our stay- it was an pleasure to stay here. well worth the money. Very pleasant quiet location out of town, staff able to advice and book activities,wifi very good and food of high class.Also enjoyed the pool. 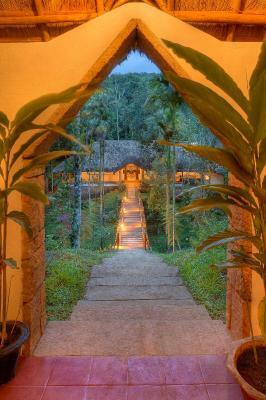 With a mountain stream meandering through the property, Shalimar Spice Garden is situated amidst the cool mountains of Thekkady. 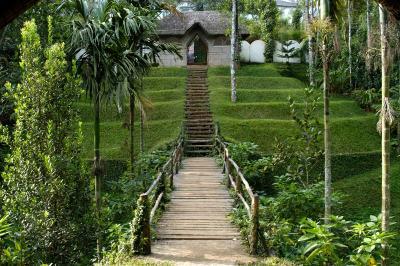 Surrounded by green spice plantations, it houses an outdoor pool and 2 dining options. 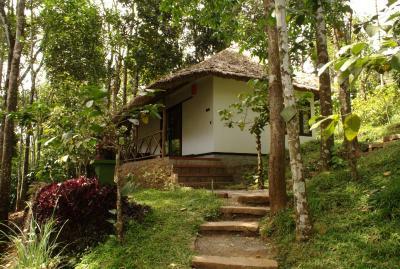 Located at the edge of Periyar Tiger Reserve, the property is 2.5 miles from Kumily Town and about 2.9 miles from the KSRTC Bus Depot. 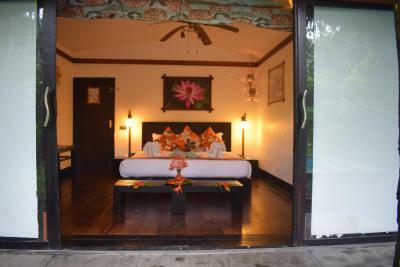 Offering a blend of European and Indian décor, Shalimar’s rooms and cottages feature a terrace with garden views. Tea/coffee making facilities and a minibar are included. Private bathrooms come with shower facilities and a hairdryer. 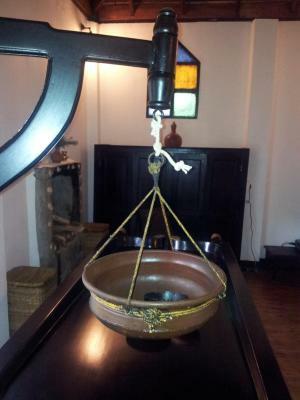 Featuring local antique wooden furniture, Falling Leaves serves a variety of Indian and European dishes. In-room dining is possible. The Red Lounge features drinks in a relaxing environment lit and warmed by a crackling fireplace. Guests can go for an Ayurvedic massage, or head to the library for a quiet read. 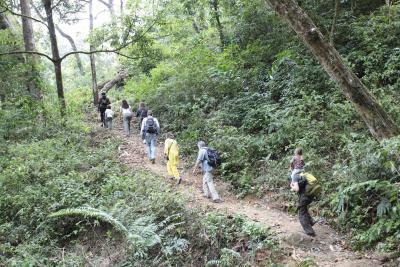 The tour desk can arrange for activities such as trekking, rafting or tribal village visits. The 24-hour front desk can assist with laundry and currency exchange services. 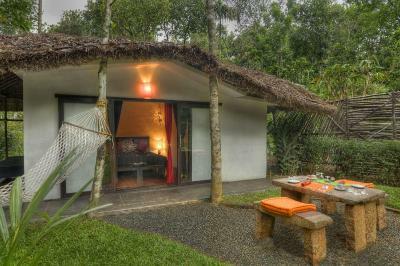 Shalimar Spice Garden - An Amritara Private Hideaway has been welcoming Booking.com guests since 8 Dec 2011. 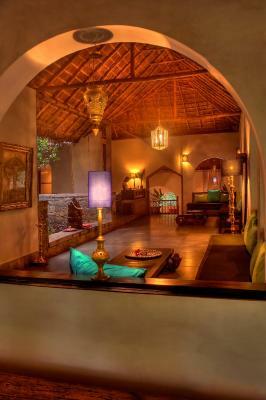 When would you like to stay at Shalimar Spice Garden - An Amritara Private Hideaway? Fitted with tiled flooring and stained glass windows, this room features a terrace with garden views. Tea/coffee making facilities and a minibar are included. The private bathroom comes with shower facilities and a hairdryer. Fitted a thatched roof, this spacious cottage features a terrace with garden views. Tea/coffee making facilities and a minibar are included. The private bathroom comes with shower facilities and a hairdryer. 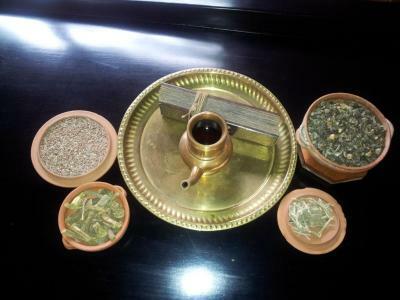 Shalimar Spice Garden is a perfect blend of European and Indian living without diluting the rich heritage of Kerala. 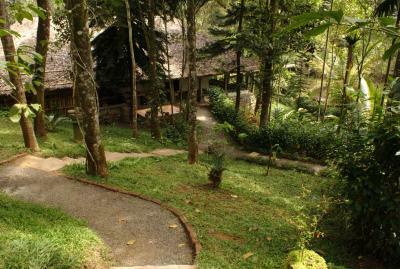 The resort merges with the spice gardens that encompass it, is the verdant landscape bordering the Periyar Wildlife Sanctuary, making it a great place for your holiday. It is the perfect place to be, for you to get closer to nature. The pace of life here is so easy and peaceful that even the birds and the butterflies do not seem to be in a hurry. 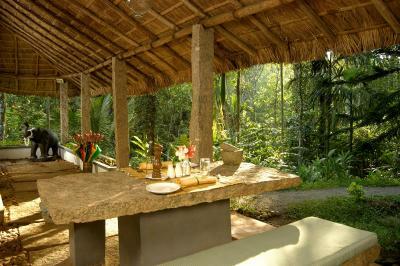 House rules Shalimar Spice Garden - An Amritara Private Hideaway takes special requests - add in the next step! 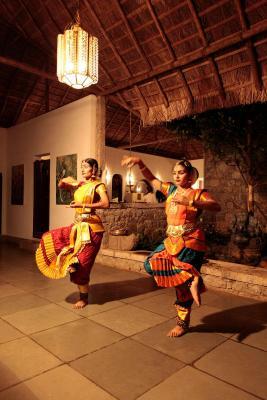 Shalimar Spice Garden - An Amritara Private Hideaway accepts these cards and reserves the right to temporarily hold an amount prior to arrival. Room needed updating. The towels were tired and furniture was beat up. Very pretty and the staff was lovely. 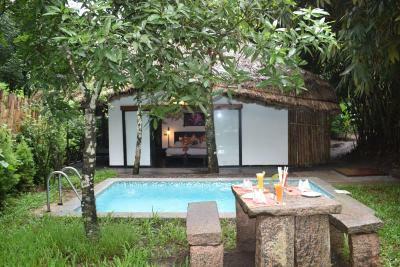 Very special location which feels like being in the middle of the jungle, and rooms and staff are equally unique and thoughtful. There was no mention of the stairs. The resort is on a hill and requires quite a bit of climbing. Not suitable for older folks. Excellent service. Very friendly and proactive staff. Good for families with kids. Everything. Atmosphere. Staff. Breakfast. Food. I felt the room furnishings could be a little improved, brightened up. Lovely stone and tiled floors should be easy to clean but seamed either stained or a bit dirty. Compared to other accommodation in the price bracket I'd expect a better level of cleanliness. Water from shower also heavily floods the rest of the bathroom. An easy fix. I felt the breakfast could be a bit more varied; cereal, toast and fruit salad buffet with the additional option of eggs (done any way) i felt didn't match expectations. Breakfast selection of fresh fruit could have been better. The standard of the room including the layout,bedding, bath area etc is not upto the market standards .. this is all with respect to what we have paid..